It's called the "Salesmaker" for a reason. 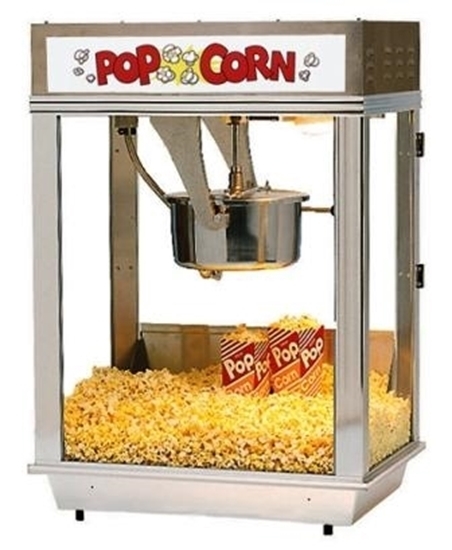 This is the industry's best Popcorn Machine, capable of popping 220 (1oz) servings every hour! Salesmaker Whiz Bang features the removable Uni-Maxx Kettle mounted in the extra strong cast aluminum twin hanger arms. Heavy duty in every respect. This 12/14 oz Popper includes the E-Z Kleen low maintenance Kettle & Uni Maxx low energy sytem. It features a clean-lined Stainless Steel top and lighted sign. GM2003ST Popcorn scoop included with popper.